Even though pearls have been around for as long as recorded human history, there is still a lot of mystery that surrounds them. There’s a lot of fact, fiction, and folklore to sort through, so let’s get started, shall we? While it’s true that pearls are the only gemstone made by a living animal, it’s a myth that removing the pearl from a mollusk (soft body, hard shell) results in certain death. While this can sometimes be the case, it’s not an absolute. It’s well-documented in the world of cultured pearls that once a pearl has been harvested, a mollusk can continue to produce pearls. Pearls are odd birds in the world of gems. Not only do they come from a living creature, they come from one that knows how to turn a bad situation into something beautiful. The story that everyone knows is that a grain of sand makes its way into an oyster and from this a pearl miraculously appears. Well, not exactly. It’s more likely that a microscopic organism hitchhiking on that grain of sand is the culprit. This would help explain why pearls are so rare. If a grain of sand were all it took, pearls would be much more plentiful. So, how does the little interloper entice a pearl out of the oyster? Once it finds its way into the fleshy part of the shell, a substance (nacre) is released to soothe the irritation. Because the houseguest won’t take a hike, over time, this substance forms a pearl. Less than one percent of the world’s pearls are natural. Natural just means that no human intervention was involved. Natural pearls have always been rare, but are even more so today due to water pollution, tsunamis, and other issues that make it really hard for a mollusk to stay in the water long enough to grow pearls of any consequence. Nearly all pearls harvested today are cultured. Cultured pearls are still pearls – it’s just the irritant that inspires the pearl is introduced by humans instead of Mother Nature. I know that some people conjure up images of their grandmother when they hear talk of pearls. But pearls aren’t called the rainbow of the ocean for no reason. They come in a myriad of colors and shades. And designs that are pretty cutting edge – definitely, not your grandmother’s pearls. The type of mollusk usually determines the color as well as where they call home. The color of a pearl is taken from inside the shell in which they grow. 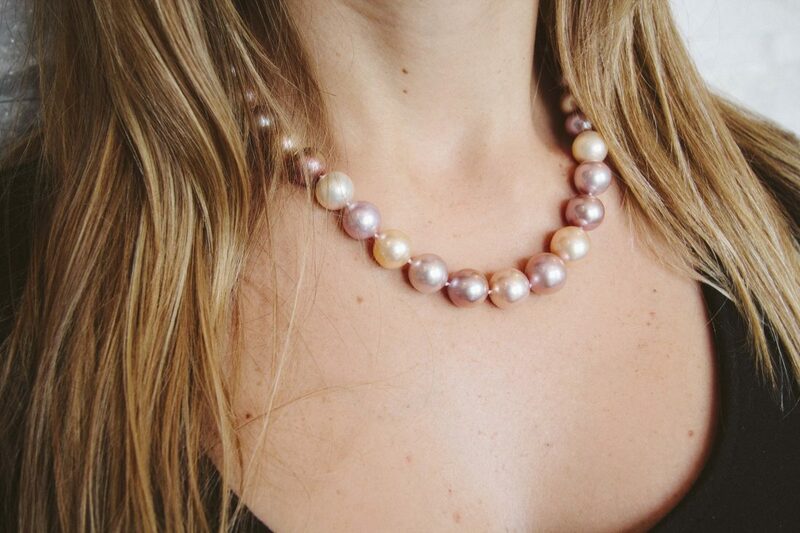 Colors in pearls consist of three components. The hue is the first impression color. The tone is the lightness or darkness of that first impression color. The saturation is the intensity of the color. There are a couple of legendary stories about pearls being consumed. One of the most famous and ancient is that of Cleopatra when she met Marc Antony. In her effort to impress him with her kingdom’s wealth, she put a very expensive pearl into a glass of wine and drank it down. That pearl would be worth about $30M today. Quite possibly, the most expensive cocktail in human history. No one knows for sure if this is fact or fiction, but after reading a biography about Egypt’s last Pharaoh, I say it sounds about right. 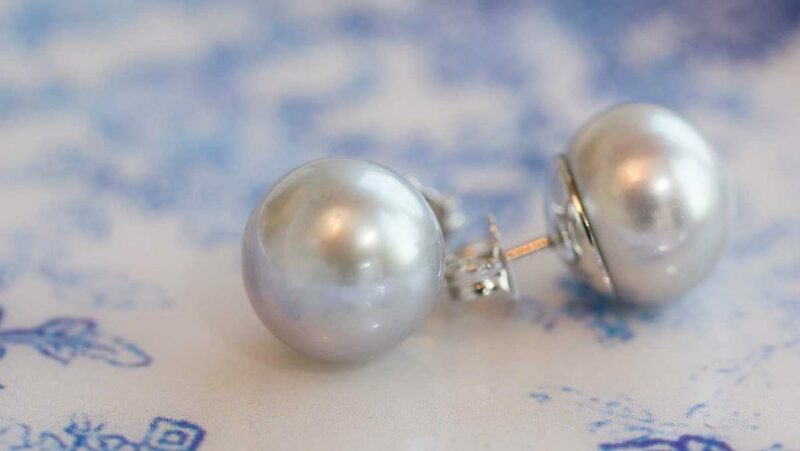 Kokichi Mikimoto of cultured pearl fame believed that pearls did a body good and was said to have eaten two pearls for breakfast every morning. Now, it’s hard to know if this was a marketing ploy or if he actually believed it – but one can only come to the conclusion that he may have been onto something since he lived until the age of 96. Though my grandmother drank whiskey and lived to be almost 100, so maybe imbibing what you love is the key. Princess and movie star Grace Kelly favored pearls on the silver screen and in her private life. She loved how they made a simple outfit stunning. Former First Lady Jackie Kennedy thought pearls were always appropriate. Fashion icon Coco Chanel said that every woman needed ropes and ropes of pearls. Cleopatra dug them, Queen Elizabeth I had to have them, and Marilyn Monroe’s favorite piece of jewelry was none other than a pearl necklace given to her by famed Yankee slugger Joe DiMaggio. They meant the world to her and were one of the few pieces of fine jewelry that Monroe owned. If not, you really should give them a try. There’s something about pearls that’s hard to explain. Marilyn knew it – Jackie knew it – and Coco damn well knew it. All of them would tell it to you straight if they were here. They would say that you not only should have pearls in your life, you absolutely need them. There isn’t a powerful or enigmatic woman anywhere in human history that didn’t have pearls along for the ride. They were all pearl girls. Whether it’s your first piece of pearl jewelry or your tenth, I would love to help you find just the right design. Call this pearl girl at 619.223.2151 or stop by so we can talk.